The Birth of Acupuncture in America: The White Crane’s Gift is a book on a topic that receives surprisingly little in-depth attention: the origins of clinical acupuncture in the United States. With the West Coast cultural revolution of the 1960s and 70s as a backdrop, this book explores history in an intentionally lighthearted yet significant way. The narrative takes place between students/teachers and Eastern/Western narrators as they merge together—sometimes with seemingly magical vision and luck. Most acupuncture students know the story of John Reston, the journalist from the New York Times who accompanied Nixon to China in 1971, when the President attempted to open it for trade with the U.S. After Reston’s emergency appendectomy and recovery, he discovered acupuncture when doctors performed it upon him and he started feeling better. He then toured hospitals in China where acupuncture and moxibustion were being used to help post-operative patients. Upon publication of his New York Times article about this, the door to acupuncture as a possible medical option in the U.S. was opened. For most American practitioners who studied at a U.S.-based Chinese medical school, the history lesson stops there. Although both coasts and California in particular became early adopters of serious acupuncture education, traditional Chinese medicine (TCM) programs include few history classes on the topic. Steven Rosenblatt, MD, PhD, LAc, and Keith Kirts aim to remedy this injustice. Their book recounts the early stages of acupuncture acceptance as respected medicine, first in Los Angeles and eventually in most of the United States. It introduces the primary teacher of these first “Lo-Fan” students, including Dr. Rosenblatt, and does not shy away from attempting to explore the sometimes confusing, humorous, and loving way these cultures, teachers, and students clashed and meshed, despite—or because of—the sometimes significant cultural divides this old world medicine has crossed. To convey the ambitious narrative concepts, the authors structure the book using several interesting devices. First, a nod in the prologue to the classic text Huang Di Nei Jing, in which the wise imperial acupuncturist Li Po is asked questions by the youthful and curious Yellow Emperor in the traditional question and answer style. The two authors play the parts here—Keith Kirts as the simpleton and Steven Rosenblatt as the knowing doctor—but this time on a Malibu fishing pier rather than in a Chinese court. Second, there are competing West/East narratives. The first is the mentioned conversation between the authors while, the second are Dr. Ju’s thoughts, which are cleverly employed by use of fictional journal entries. These entries are derived from Dr. Ju’s teachings, interviews with his old friends, and students’ recollections. The result is that the reader sees Dr. Ju and his inner struggles more honestly, intimately, often mixed with his sense of humor. The book takes us through the initial and significant moments between Dr. Ju and his prospective students, all of whom were curious UCLA graduate students studying brain chemistry and the psychology of pain. Steve Rosenblatt and his friends became interested about this non-invasive medicine and its significant cultural and clinical history. They raised money for him to create a lecture series and, in keeping with Chinese tradition, show him they were serious students worthy of his time. The narrative convincingly conveys Dr. Ju’s emotions and ideas as he educates these intelligent, studious—if somewhat, to him, wild bunch of educated, crazy-haired hippies. Dr. Ju came from Canton at a low point in acupuncture’s history in China. He had a prophetic vision that he would bring this medicine to these Western students to save it from possibly fading from significance in his country. Through the journal entries we see his vision, his ideas, and his struggles to bring acupuncture from China to the U.S., which offered youthful energy and drive. Under his tutelage, Dr. Ju’s students start to study eastern culture and movement (qi gong and martial arts) and began to merge their education on neurochemistry with the Taoist ideas of qi or energy as we are introduced to it in section two of the book. Dr. Ju began to treat patients and teach his students at UCLA in the department of psychology. The climax of this particular narrative was his arrest for practicing without a license outside of UCLA—as this was an era preceding the existence of licenses to practice. Sadly, this act sent him back to China while another Chinese doctor and acupuncturist, Dr. So, took his place to keep the UCLA acupuncture clinic going. Based on the first part of the title, The Birth of Acupuncture in America, it is fair to expect a somewhat deep dive into the historical aspects of acupuncture’s taking hold in Los Angeles. The focus actually falls more on the teacher and the moment his vision blossoms and is transmitted to future teachers (another form of energy transference). With this, the last portion of the title rings truer: this book is more about the gift of this medicine from one teacher and culture to another. While the first section of the book is unnamed, the second section of the book, titled “The Practice”, introduces the reader to concepts of qi or “energy” in Chinese medicine. The discussion about energy (a word some in the field of TCM consider overloaded already) may also raise some questions for those of us educated in TCM after the 1970s. The information is a mixture of Eastern and Western concepts of energy. For example, homeopathy is a medicine Dr. Rosenblatt uses, and discuses as an energetic correlate to acupuncture, but it should be noted that it is not taught in most American Chinese medicine colleges and has no major cultural link to China. In my experience, not many acupuncture students know that practicing Chinese medicine was considered a felony crime before there were state laws and practice acts. This book is useful in that it reminds us of the issues encountered when acupuncture first came to the U.S. shores. The merger of Chinese and Jewish humor (from the two main narrators) also adds a nice touch of levity and acumen to this courageous tale of unique people from two cultures being united to create what they would call simply quality human healthcare to alleviate suffering. 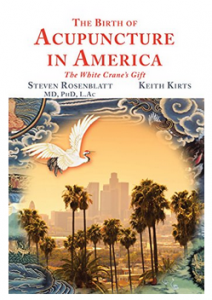 In summary, The Birth of Acupuncture in America: The White Crane’s Gift is about a moment of birth, recognition and divine luck, like any birth. Once it arrives it seems pre-destined, but it is easy to forget how magical this moment initially was. This book focuses lovingly on what it considers the parents of that movement—ultimately the specific teacher and students teaching natural law truths about energy and healing. For anyone interested in how acupuncture came to the U.S.—at least from a Southern California perspective—this book is an enjoyable read. The second section in particular may serve more as an exercise in what Dr. Rosenblatt considers to be energetic models and a curiosity to established practitioners as opposed to those new to this field looking for a basic overview. Regardless, the narrative’s careful writing as well as its humor makes me feel its words are a helpful continuum of the lucky conception that all of us who practice this legally sanctioned medicine in the U.S. share to this day. For those of us who don’t yet live in a state with a sanctioned practice act for acupuncture, as there are still a couple, here’s hoping the white crane flies there soon, completing Dr. Ju’s vision and inspiring a few more students to become acupuncturists along the way. Mitchell Harris LAc, MSTOM practices traditional East Asian medicine at his clinics in Rogers Park and Lakeview in Chicago. Mitchell is the chair of clinical procedure and former chair of faculty governance at Pacific College of Oriental Medicine where he also teaches and supervises in the residency program at the Chicago campus. He is the is the creator of the tincture line Herbs From East and co-founder of the integrative medical video website IMNEducation.com. 2016, Book ASIN: B07965BDXR. Balboa Press. 158 pages. Previous PostPrevious Too High on High Fructose Corn Syrup?